Lowerhouse captain Ben Heap struggled to keep his emotions in check during a thrilling win in the Worsley Cup final against rivals Burnley. The occasion, the first of its kind after 93 editions of the competition’s grand slam, ebbed and flowed like a typically classic contest, with both sides in contention to claim the silverware in the closing stages. With the perimeter at the Brooks Foundation Ground bursting at the seams, the hosts were first to assert their control on the tie as they had Burnley treading water on 16-2, 88-6 and 109-8. But the visitors, led by skipper Dan Pickup, rallied at the tail to set their opponents a target of 170 for victory. 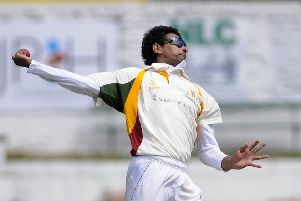 Professional Asif Zakir had top-scored for Burnley with a knock of 42 at number three while Pickup (24 not out) and Tom Lawson (23) ensured they posted a more competitive score. The chase couldn’t have got off to a worse start for the West Enders when they lost Heap off the first ball with Joe Martin following shortly after with just 15 runs on the board. Australian international Mark Cosgrove played out a patient half-century, adding to his 3-31, to help lift the hosts to 108-6 having been reduced to 47-5 earlier in the innings. Charlie Cottam, who guided the side to glory in 2012, played an integral role in swinging the pendulum back in their favour as they rose to 142-7 before Chris Bleazard (20 not out) and Joey Hawke (19 not out) finished the job off. “The game itself ebbed and flowed, which is what you want in a final,” said Heap. “It wasn’t easy watching on from the side after I was out first ball. I wanted to be out there trying to control things. It turned in to a high quality game with plenty of drama. “I was very emotional. I was up and down the whole way through our chase. I just couldn’t control my emotions. I wanted to win so badly. Heap, who featured as a teenager in 2004 when the club won the trophy for the first time, added: “Burnley handled finishing on the wrong side of the result really well. They certainly played their part in a memorable final. We’re not too dissimilar sides. We’ve both got a strong bunch of amateurs who are capable of batting all the way down.